Ever wonder where the idea or dream of Hastings originated? Well as part 1 of our anniversary year blog posts, we thought this would be a good place to start. Charles Hastings at the age of 10 was bitten by the radio bug and began to build and experiment with radio gear. In 1930, at the age of 16, Charles Hastings found an opportunity to fund his experiments by fixing other people’s radios. Many families had radios at this point, but they were very unreliable and frequently needed minor repairs. Charles would fix radios to earn money to buy parts for his own experiments. Soon, Charles moved on to building transmitters and enlisted the help of his high school friend, Raymond Doyle. Their first success was when Charles spoke into a microphone and Ray heard the broadcast from his aunt’s house which was down the street. Unfortunately, the broadcast covered the entire spectrum of commercial radio broadcasting, so the entire neighborhood received the broadcast as well instead of their favorite radio programs. After this first broadcast mishap, Hastings decided to go back to radio repair. Charles Hastings went on to attend John Hopkins University and majored in Electrical Engineering. Upon graduation, he was offered a position as Junior Scientific Aide with the National Advisory Committee for Aeronautics (NACA) in Hampton, Virginia. 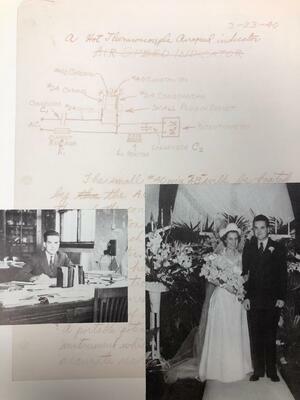 In 1939, Mary Comstock joined NACA as a mathematician and Charles was quick to ask her out for a date. They were married within a year. Working at NACA proved to be quite rewarding to Charles. He came up with an idea for a magnetically operated reed switch for the spin tunnel section in order to flip the controls in its free-spinning airplane models. This moved on to finding accurate methods to measure the speed of aircraft. In 1940, Charles did just that, he came up with an idea for an airspeed indicator using a heated thermopile. The idea was tested later that year at Langley Field in measuring the speed of planes. This was the first continuous-wave heterodyne system ever used for speed measurement and was names the NACA Radio Ground Speed System. His work continued at the NACA for a few years, but Hastings became restless and wanted to be on his own. He felt that the work he had done with Radio Ground Speed System had more potential in the measurement of distances. Initially Charles Hastings only wanted to create ideas for commercial products and sell the rights to others in exchange for royalties. Hastings longtime friend James Benson was interested in being a part of this new. Hastings Instruments Company was born in September 1944.